Meet Heidi from Aldebaran Farm, homegrown in Downingtown, PA! Hello Growing Roots Partners Farmers Market Enthusiasts! We are Aldebaran Farm, and we would like to introduce ourselves to you as this is our first year with Growing Roots Partners. Heidi Ochsenreither and Dan Risser are the owners and operators of Aldebaran Farm. What kind of farm is Aldebaran Farm? Aldebaran Farm is a small (one acre) diversified vegetable farm committed to sustainable growing practices. We grow microgreens, pea shoots, salad greens, cut flowers, and other mixed vegetables such as carrots, cauliflower, peas, tomatoes, squash, peppers, kohlrabi and all of the other vegetables you would find at a typical farmers market. We use a small walk-behind tractor called a BCS because we have a small space to work with, and it is lightweight to avoid soil compaction. 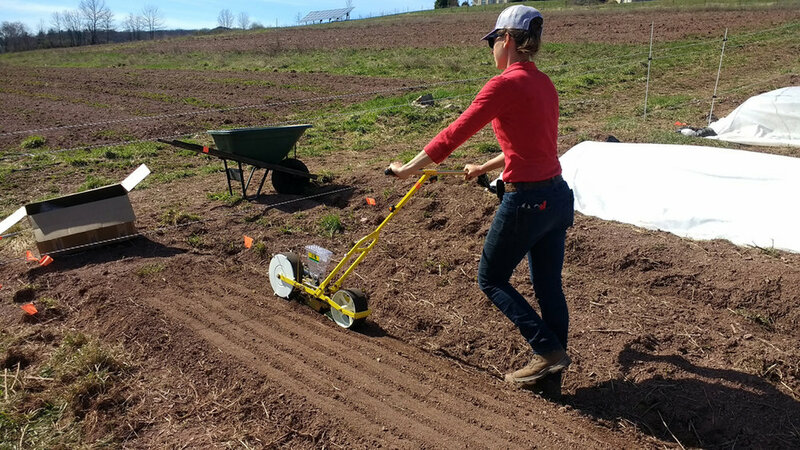 Every bed in the field gets broadforked and raked before transplanting or seeding. When was Aldebaran Farm created? Aldebaran Farm is in its first year of business! Needless to say, this is an exciting and scary year for us, and we truly appreciate you stopping by, getting to know us, and trying something new. Where the heck is Orwigsburg, and why are we selling at Downingtown? Orwigsburg is located in Schuylkill County, PA, and our farm is just five miles from Hawk Mountain. We are farming in a temporary rental situation this year. Finding farmland is one of the most difficult hurdles for young farmers, especially those of us like Heidi and Dan who did not grow up in farming families. In the future, we hope to move closer to Chester County, both for the farmers market and also because Downingtown is where Heidi grew up! That’s right, Heidi is returning to her roots: her Downingtown history goes way back to attending elementary school at West Bradford Elementary, through graduating in 2003 from Downingtown Senior High School. Dan is no stranger to Downingtown, either. Heidi and Dan met while working as apprentices at Two Gander Farm in Downingtown in 2013, the same year that Downingtown Farmers Market began. Some of you might also recognize Dan from Malvern Farmers Market that year, as he sold produce for Two Gander Farm on Saturday mornings. 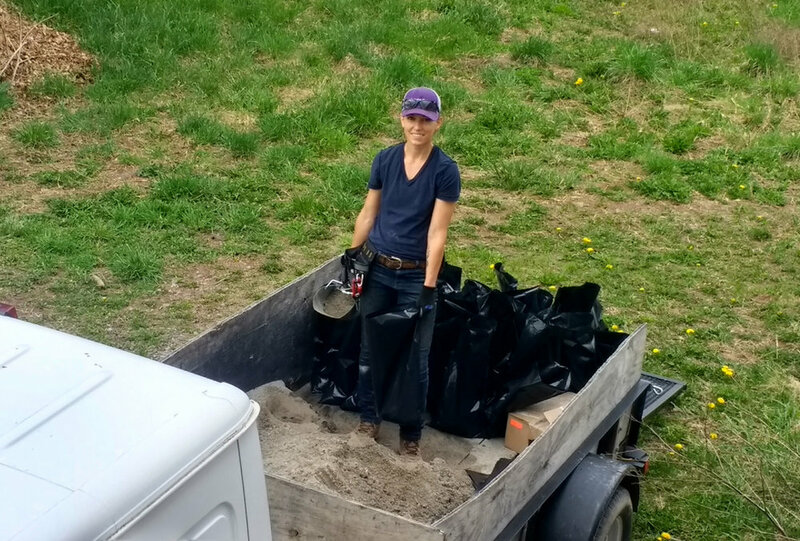 First year on the farm means we have a lot of sandbags to fill! Dan is setting up irrigation for the first crop we planted: cauliflower! We have an amazing assortment of heirloom tomatoes that are looking healthy in the greenhouse, knock on wood! What makes you say you are “sustainable,” and why are you not certified organic? Our love of nature propelled us into the field of agriculture. We would never spray synthetic pesticides or fertilizers because it goes against everything we believe in. We believe that when a farmer creates a diverse and healthy ecosystem, crops remain healthy and resilient. We are experimenting with many different techniques in these first years in order to find a system that works best for us. For example, we will not use the plastic mulch that many farmers, even organic farmers, typically use. Instead, we are trying a system that includes straw, leaf mulch, and wood chips. 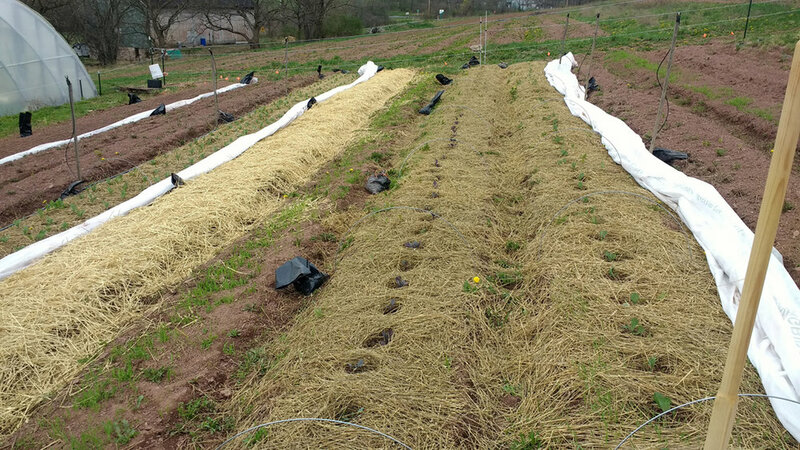 This method of mulching suppresses weeds while building up soil biology. We also use landscape fabric as a mulch because it is reusable for many seasons and allows moisture and oxygen to circulate. We also prefer not to till our land. 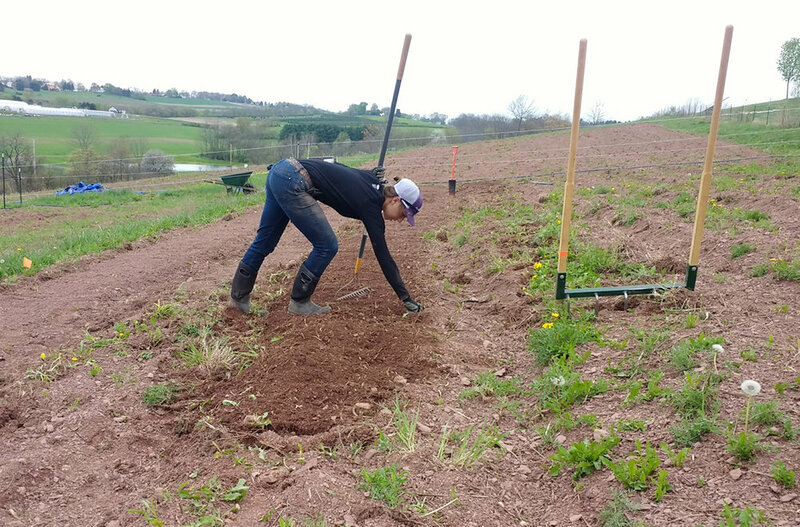 While we had to do an initial tillage on the land because it had not been farmed for three years, we will not do any more the rest of the season because it is damaging to the soil biology. We could geek out about our methods for hours, but we will keep it short here. Feel free to ask us anything at market! We are experimenting with our own custom blends of microgreens. The giant snowstorm in March set us back a bit and really made us hustle in April. 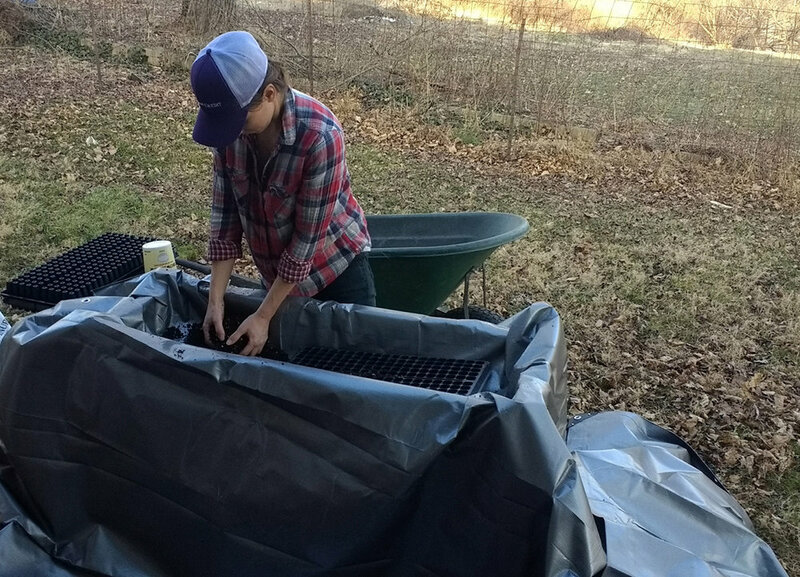 Dan is never happier than when he is organically fertilizing our plants. Don't let the backpack sprayer scare you - this is only used for an organic foliar leaf spray. We considered getting organic certification this year, and went so far as to purchase all organic seeds and cover crop. However, we do not think that the certification cost would be worth it to us because we could potentially have to leave our land as early as November. If we had hoop houses to extend our season, or if we had a guarantee of staying on this land for another year, we would get certified. We purchased all organic seeds for our vegetables this year. We make our own potting mix with peat moss, worm castings, perlite, and minerals. The infrastructure takes some time to get up and running on a new farm, but we roll with it and make do with what we have. What will you have at market on Saturday? We hope that you will bear with us as May will be a slow month! Unlike many farmers, we do not have access to hoop houses for season extension. So while everyone else is growing beautiful greens and starting their cucumbers and tomatoes in the hoop house, we are reliant on good old Mother Nature this year. That being said, we have some beautiful microgreens and pea shoots growing this week (a little slower than we would have hoped for with the cloudy weather…) and some transplants. At the very least, we will be there to say hello and meet all of you wonderful supporters of local farmers! We can’t wait to meet you!